It is Tuesday morning and the mist is slowly lifting in the small mountain village of Heliconia in Antioquia in northwest Colombia. We are on our way home to Emilio Gonzalés, one of the participants of Next Generation Coffee, an initiative for the next generation of coffee farmers. - The training and the support I get mean a lot to me. 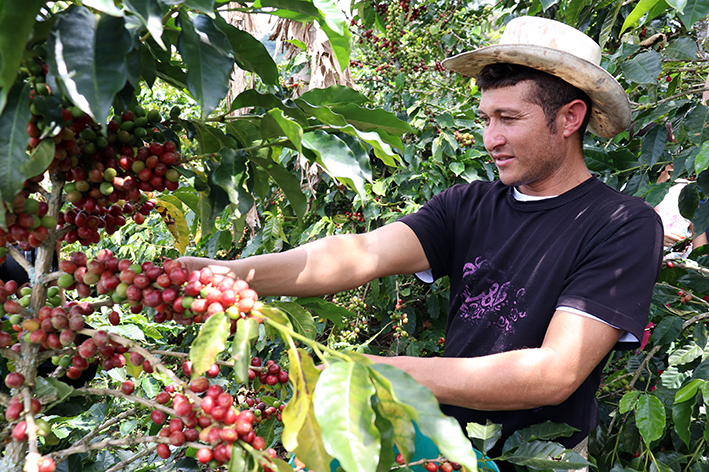 I used to farm coffee, but now I am a passionate coffee farmer, says Emilio. A lot has happened since our last visit to Emilio. He tells us about the investments he has made and how new knowledge has contributed to the development of his coffee farm. More about that soon. 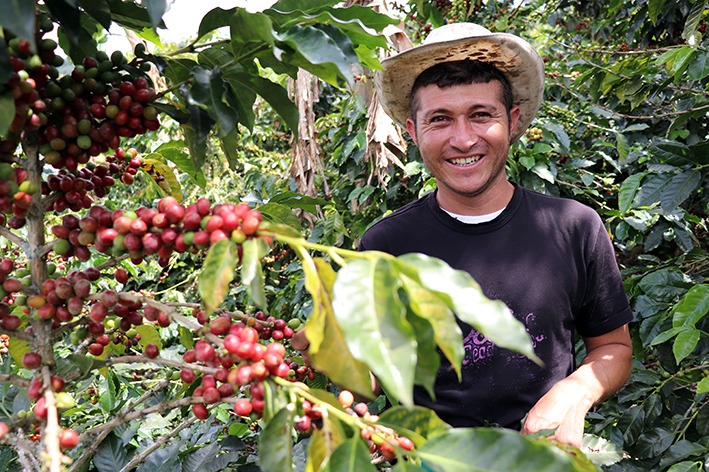 Emilio is one of 550,000 coffee farmers in Colombia. The coffee is an important part of the country’s culture and economy. Colombian coffee has a good reputation, and the export creates significant income for the country and its inhabitants. But just as in many other places, the average age among farmers is high, closer to 60 years. Fewer young people see a future in coffee, which in the long term is a threat to the supply of good coffee. That is why we started Next Generation Coffee, where we through training and direct trade improve the possibilities for Emilio and other coffee farmers of the next generation. Emilio tells us that he is a bit tired after the weekend’s football game, the one he plays every Sunday together with his friends. Otherwise, most things in Emilio’s life revolve around the coffee farm. From morning to night. - I wake up at five o’clock and always start my day with a smoking hot cup of coffee on my porch. I take a walk down the steep track to my coffee farm, which takes me about 15 minutes. Then I mostly have my hands full for the rest of day. A couple of years ago, Emilio thought about seeking his fortune in Medellin, the second largest city in Colombia, a few hours’ drive from Heliconia. - But when I got a piece of land from my parents, I reconsidered matters. It was tough at first, but I have learned a lot and been able to develop my business. Emilio farms coffee on a 0.6 acres area, about the same size of half a football field. He often works together with his brothers. All coffee is picked by hand, and he hires a couple of people when it is time to harvest. - Creating jobs is another one of my driving forces, as I contribute to the development of Heliconia. The harvest is late this year. 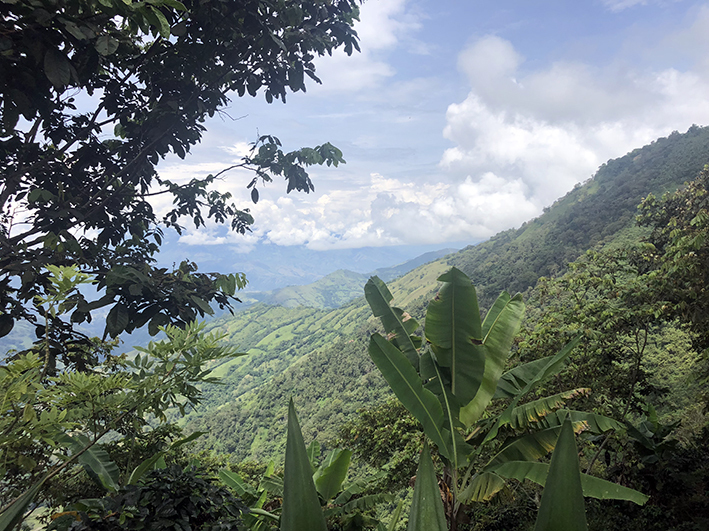 The climate change is noticeable; many unripe, green berries still hang on the coffee bushes that normally are crammed with ripe, red cherries at this time of year. - It means quite a lot of extra work. The harvest time is prolonged since we have to pick the cherries for a longer period of time. I cannot wait until everything is ripe as the risk of damages on the cherries will increase, so I have to pick the ripe cherries every day. Facing climate change is an important part of the training that Emilio gets through Next Generation Coffee. The training is carried out in cooperation with Federación Nacional de Cafeteros (FNC), the national organization for Colombia’s coffee farmers. - I have learned to make soil analyses, utilize manure in the right way and I have received assistance to plant new types of coffee plants that stand the climate change better. It has led to my trees giving more and better coffee beans. Emilio can invest more money in his business as his incomes increase. He has planted 2,000 new coffee plants and built a new drying facility since we were here the last time, a year and a half ago. - I am investing to be even more successful. It makes me able to create more job opportunities and that my family and me can live a better life. It is really great. Emilio and the other participants of Next Generation Coffee in Colombia are a part of the Fairtrade cooperative Antioquia, which was announced as the best cooperative in the world in 2011. Fairtrade is a certification that guarantees the farmers a minimum price that covers the farming costs, even when the world market price is low. - The price for coffee varies, it is very low right now. It is a challenge for all farmers. I have still been able to lend money for my investments through the cooperative. Emilio says that he and the other participants of Next Generation Coffee are regularly getting together to share their knowledge and experience. Everything from farming methods to finance and entrepreneurship. - Us getting together and learning from each other is valuable. I have become known for my quality and I feel very proud when other people ask me what I do to succeed. I believe it is about the passion I feel for my coffee farm and that I constantly want to be better. - I would like to purchase a machine to roast my own coffee. Then I would learn even more about flavours and qualities, and I think it will help me become even better. It might sound a bit crazy, but you have got to dream. Emilio lives together with his parents, siblings, nieces and nephews. Emilio picks all coffee by hand; 64 beans are needed for one cup. The new drying facility makes it possible for Emilio to dry the beans in a better and safer way. It has improved quality and makes him get better paid. Emilio tells us that climate change has an effect on the crop. When the rain and drought periods are becoming heavier and more irregular, it is harder to farm coffee. The view from Emilio’s farm is magnificent. As a part of the training, Emilio gets regular visits from the FNC staff.